Truth emerges from the body. There is no division between materiality and transcendence. They are one, fused. Like bones reaching out from the void within us – paths of fidelity compress the heavens and the earth. We are Truth. Our very bodies are events; that is to say, meaning machines – tracing paths of radical newness. “OSSIFY fuses immanence with transcendence. A rope “umbilical cord” connects the animal realm with the heavens. The bodily and the transcendental become inexorably linked, compressed, even, into one. 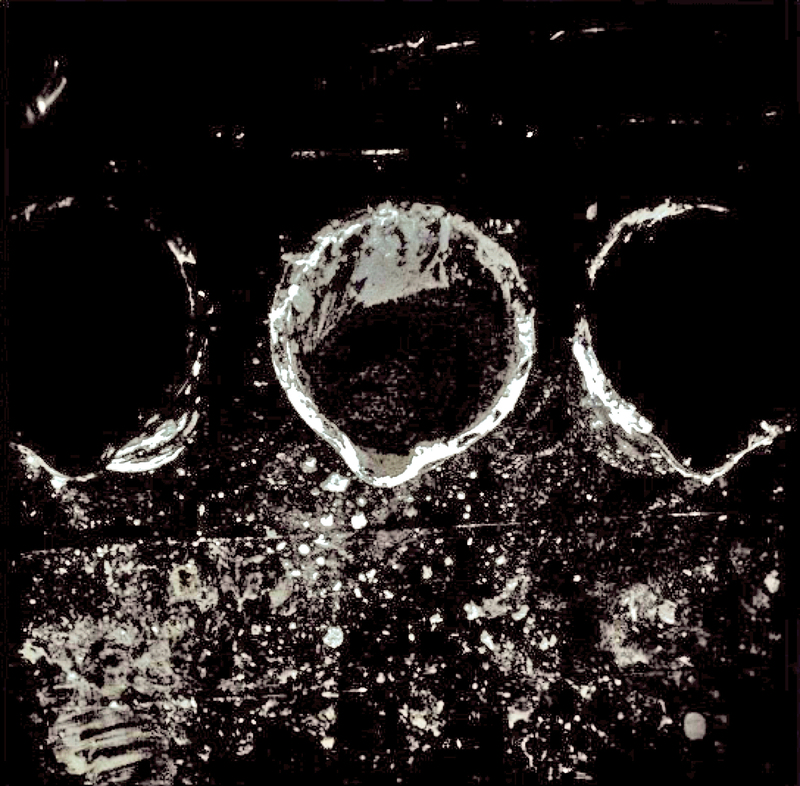 A bone is created, emerging from the void at the center of an animal skin. The athletic performance solidifies the field of Truth within the body. Its connection is ossified. 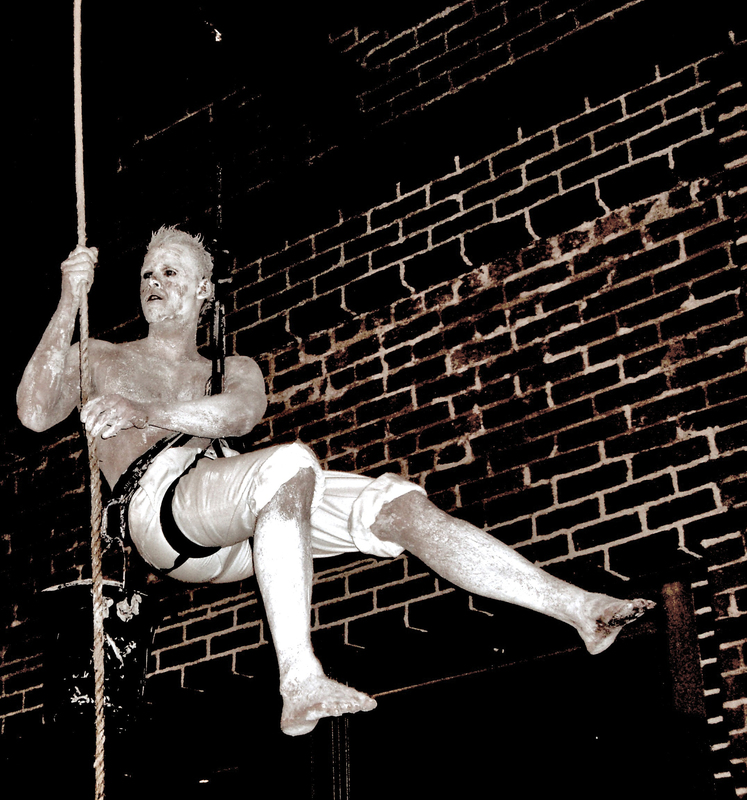 Wearing white pants and a black harness, “The Climber” is covered from head to toe in white kaolin clay. His partner, “The Belayer,” is dressed similarly in black. Paul Wallace as "The Climber"
A zebra skin rug lies on the floor. The rug is in the shape of Wallace’s matheme for “evental void” – a rectangular hole within a larger rectangle, 3 times the size. Here, the hole is raised from the ground forming a sloped box. A 14 foot woven rope stretches from an I-beam on the ceiling to the box, its slack curled within. Beside the zebra skin rug are 3 buckets: one with plaster, one with water, and one for mixing. 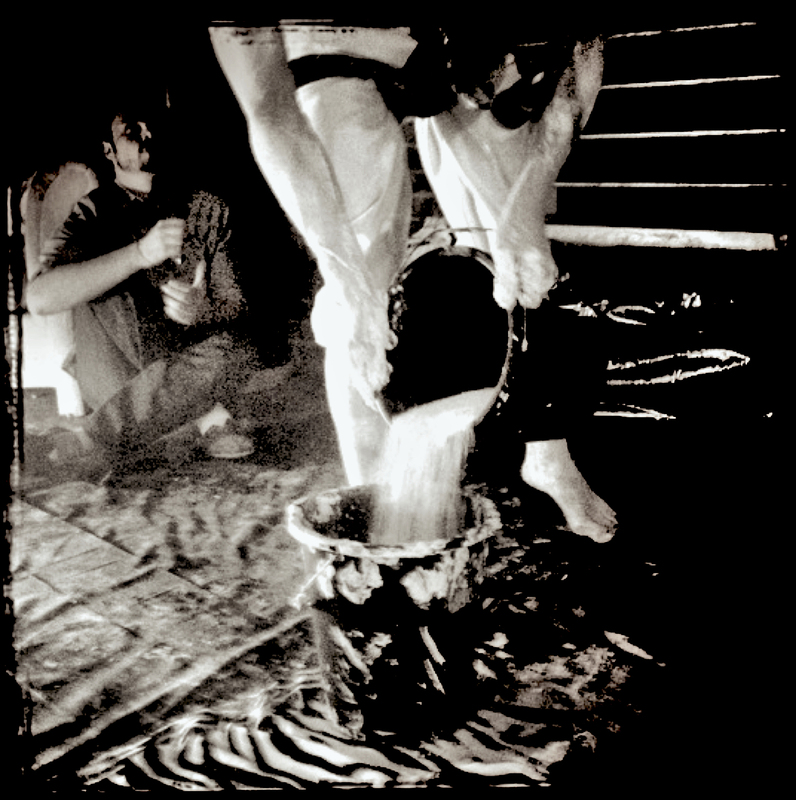 zebra skin box - matheme for "evental void"
As the performance began, The Climber started mixing plaster. 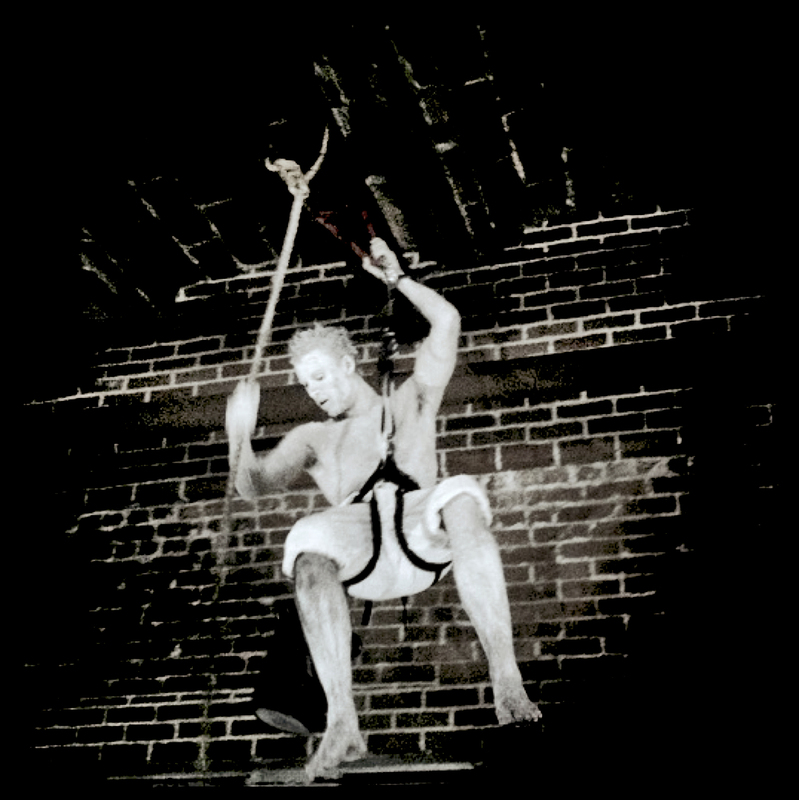 The Climber then attached the mixed-plaster bucket to his harness. 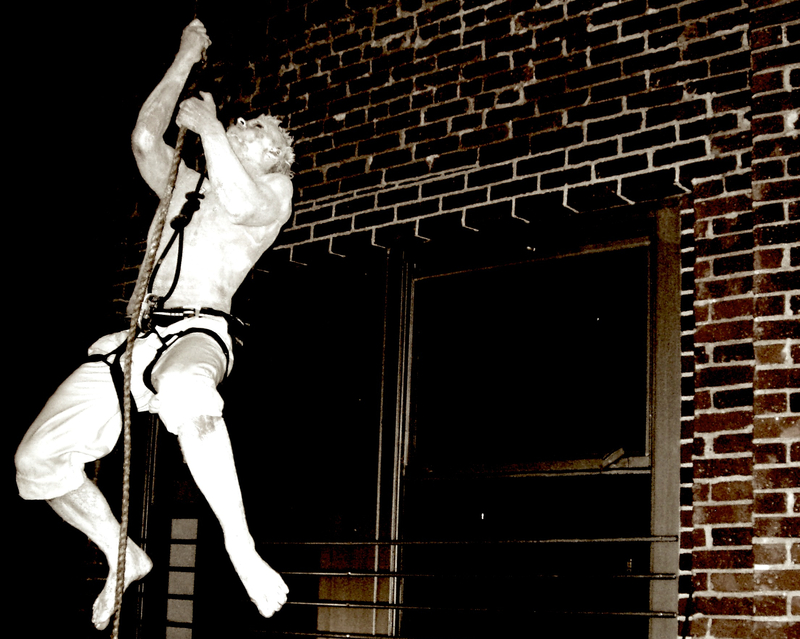 Using only upper-body, he ascended the rope. Once at the top, The Belayer locked him off, freeing The Climber to use his arms. The Climber then worked the plaster onto the rope as it dried, working from the top down on multiple climbs, slowly ossifying the rope. 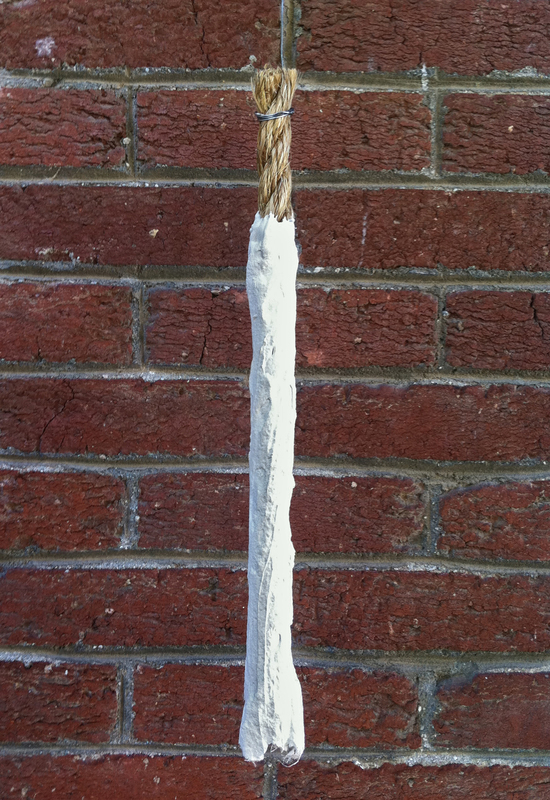 Excess wet plaster dripped down the rope’s length, collecting in the zebra skin box below. 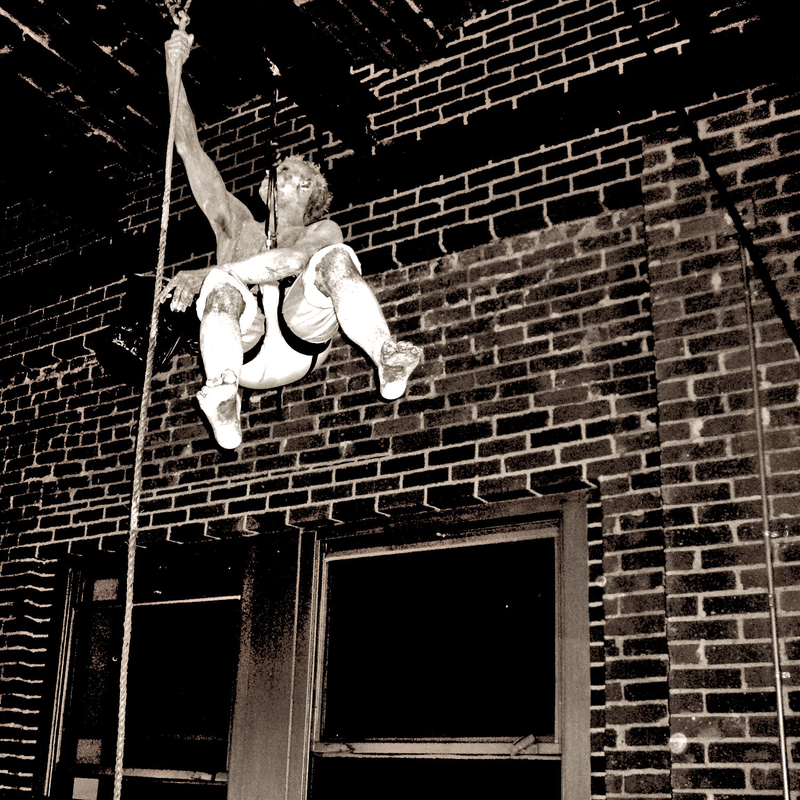 As The Climber neared the bottom, he began to work the plaster on foot. 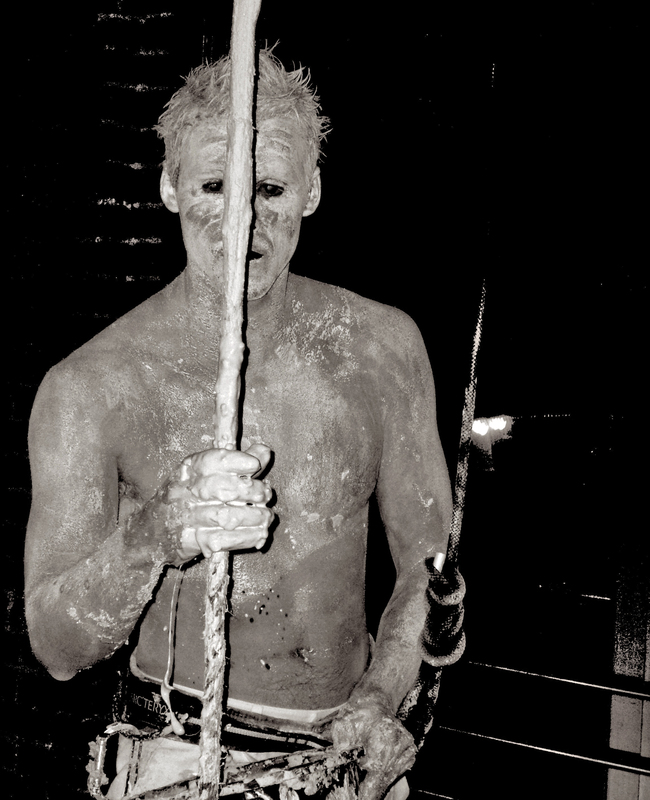 The performance concluded once the rope was hardened. 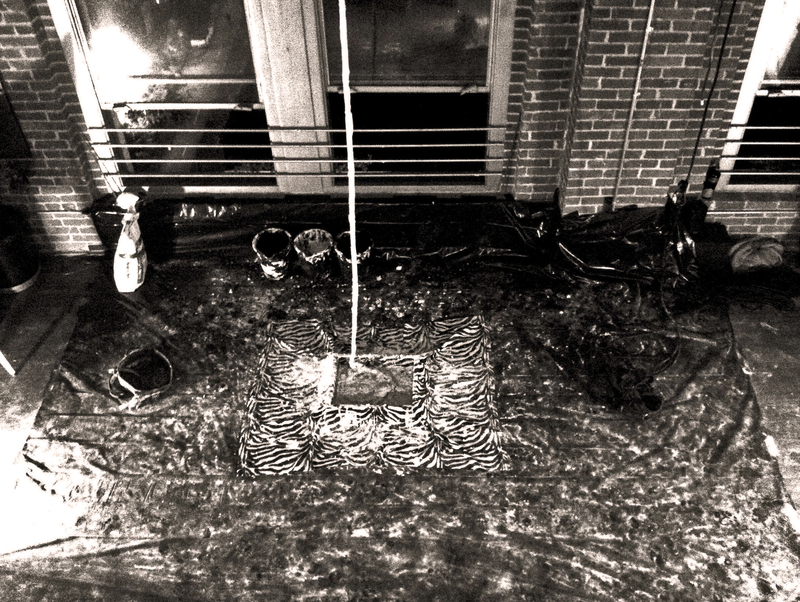 The ossified rope stretched from the zebra skin rug to the I-beam on the ceiling. The box was filled with plaster. The rope was bone. 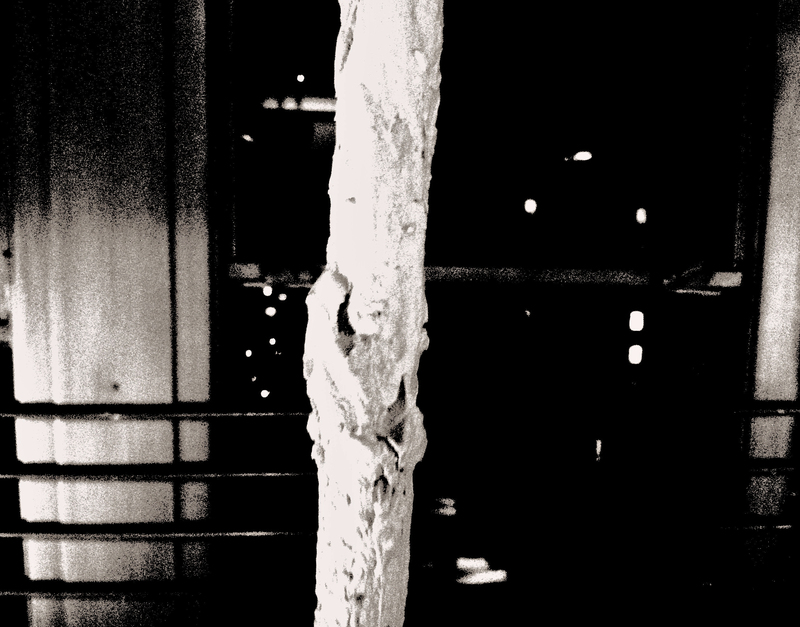 The material remains of the performance, of the work done, was left along side the sculpture. The buckets were in a row; plaster and clay dust made the floor black and white, just like a zebra pattern. 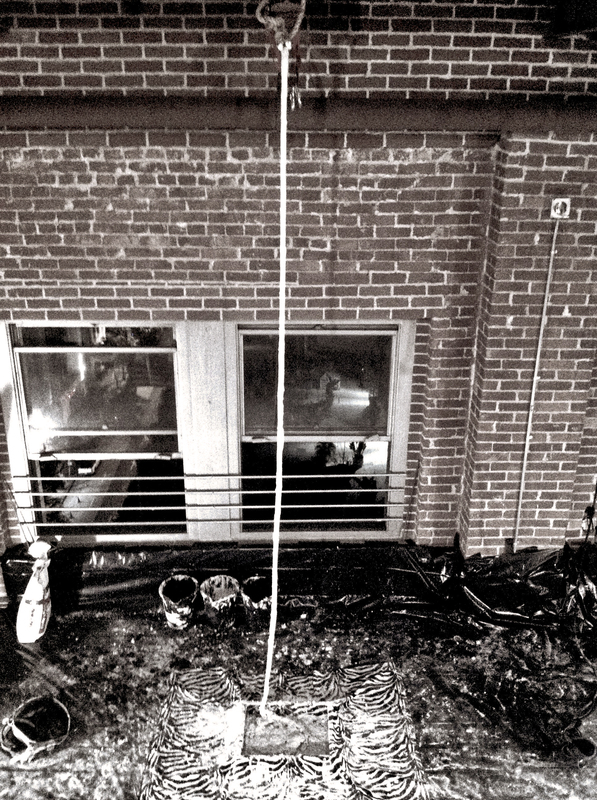 The top rope and belay device were left, and the harnesses were arranged on the floor. Together, these constituted the final installation. A new series of sculptures will continue the themes explored in OSSIFY. This entry was posted in New Work and tagged installation, performance, sculpture. Bookmark the permalink. 3 Responses to new work (OSSIFY). I love your narrative of the performance and really enjoyed looking at the photos in this sequence. Beautiful work! was there/is there any audio associated with the performance or the ongoing manifestation of the piece?